Anything you’d like to rid yourself of as the year is coming to an end? Maybe an unwanted circumstance in your life, a habit, a job or a relationship? Then today might be a good day to start allowing it first. Allow, in order to release. As much as we always say we’d like to change certain things in our lives, in many cases it remains just a thought or a conversation for the longest time. What about actually doing it? I’ve been chewing on this for quite some time, as there are many things, thoughts, habits, that I’ve created and maintained over the past 33 years that don’t serve me much (anymore). Why is it so hard to just let go of that which isn’t beneficial to us? Maybe, I’ve found, it’s because we’re trying to skip some steps in the process: to acknowledge, to accept, and to allow. Many of the “unwanted” (or not consciously invited) situations we face in our day-to-day stem from some form of resistance. Resisting change, resisting impermanence, resisting development, resisting what’s foreign, resisting what’s unknown. All for but one very simple and understandable reason: avoiding emotions we’d rather not experience. 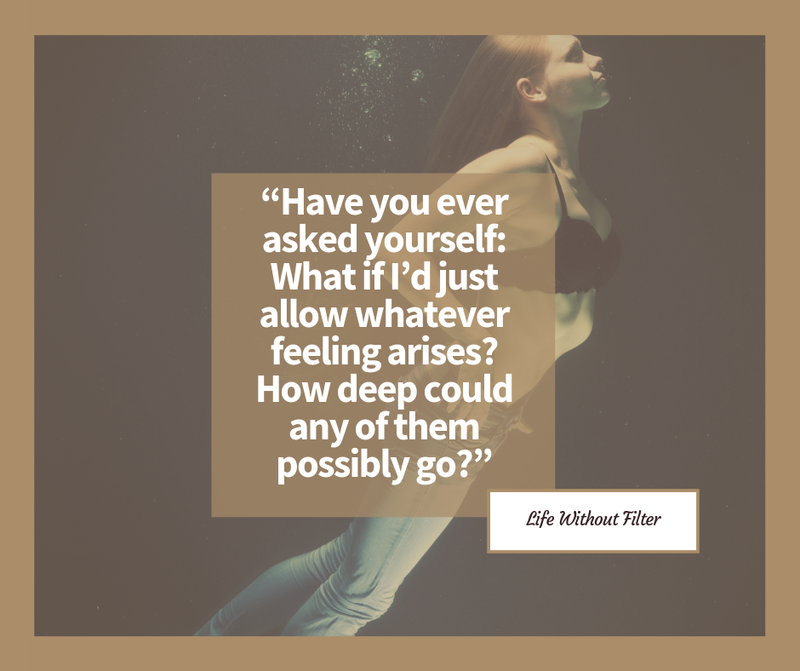 Have you ever asked yourself: What if I’d just allow whatever feeling arises? How deep could any of them possibly go? To overcome any of the undesired things in our lives, I’ve come to discover, it really helps to first stop labeling them as such. Whatever life seems to “throw at us,” we always form some sort of opinion or preference. That thing over this thing. That job over that one. This person over that one. And it goes on and on and on. It’s our human condition. We can’t stop being either pleased or unpleased by the things, places, and people we encounter. And there’s nothing wrong with that of course, as it helps us create the lives of our own individual choosing. But what would happen if we’d stop resisting the things, people, situations, that we experience as unpleasant and simply start allowing them for what they are too? How can I be with this, too? “Bad” things are only “bad” if we make it so ourselves. Like the Buddha taught: pain may be inevitable, but suffering is not. One of my favorite authors, Buddhist nun Pema Chödrön, wrote about pain and what it’s actually teaching us in her book The Answer to Anger & Aggression is Patience. Whenever there is pain of any kind she describes here, whether it be aggression, grieve, loss, irritation or jealousy for instance, you will always find that when you look into what’s behind the pain, there’s always something you’re holding on to. Something that you’re attached to and a new situation (that which we think is causing the pain) that you’re not allowing. In my teenage years I listened to En Vogue a lot. “Let it flow, let it flow, let it flow,” I’d sing along – all the while trying to ward off that adolescent whirlwind of emotions I was going through. How can I be with this better? How can I allow this more, so I can come to the full understanding of its meaning? Let’s say you meet a wonderful person tonight (a man or a woman, whatever you picture when I write “wonderful person”). You spend the most amazing two hours chatting, laughing, and making silly jokes while enjoying a drink or two in your favorite bar. During this time, you experience such a joyful connection with this person, that the moment you wake up the next day he/she is the first thing on your mind. Immediately, you start to reminisce about the lovely night you spent together. Unfortunately, you forgot to exchange numbers, so you decide to find this person on Facebook. You put yourself out there, and you send that friend request. And now, you wait. Anticipating that – hopefully – this person will be just as thrilled as you are to stay in touch and talk some more. But time passes, and nothing happens. He/she does not reply to your friend request. So you start telling yourself some stories. Of course, aided by some of your friends, whom you’ve already told all about it by now. Maybe the connection you experienced those two hours was only on your part? Maybe he/she didn’t like you at all? Or maybe they’re in a relationship they forgot to mention to you before? And then, as life has it, you bump into this person again. Randomly, or so it seems, in a store. But as you have no idea as to why this person never responded to your friend request, you act aloof as he/she comes over to greet you. You block the conversation from ever getting started the second time around, and the whole situation is one big disappointment. For the both of you. Now, you come to the conclusion that these moments you once shared weren’t that special after all. How else could it have resulted in all this dissatisfying stuff afterward, right? In reality, the only thing you see reflected here is your resistance of the impermanence of the beautiful interaction you experienced with this person. It was your impatience to let life bring the two of you together again – if meant to. And your attachment or expectations towards this other that made you come to all of these conclusions. You chose to experience all of this turmoil when instead, you could have just had what it was: a really spontaneous, enjoyable, fun moment together. This is not to say one could never take action based on an experience, of course. But it perfectly illustrates how trying to control something or someone can result in the opposite of that which we desire, if we’re not allowing what is to be just that which it is. The moment we set expectations and cannot be satisfied until the expectations are met, we’re holding on to something outside of ourselves in order to be happy. And to hold on to something is to resist the natural flow of life. The art of allowing, then, is to let each moment arise, pleasant or unpleasant, and let it be what it is, without any predetermined desired outcome or result. We can still define our preferences, but then we can just let it go. In the example above – depending on your previous experience with men/women and the stories you told yourself then – no real harm was done. But situations (or people) can also trigger past trauma. And the emotions that then arise may be more intense than the actual situation calls for. 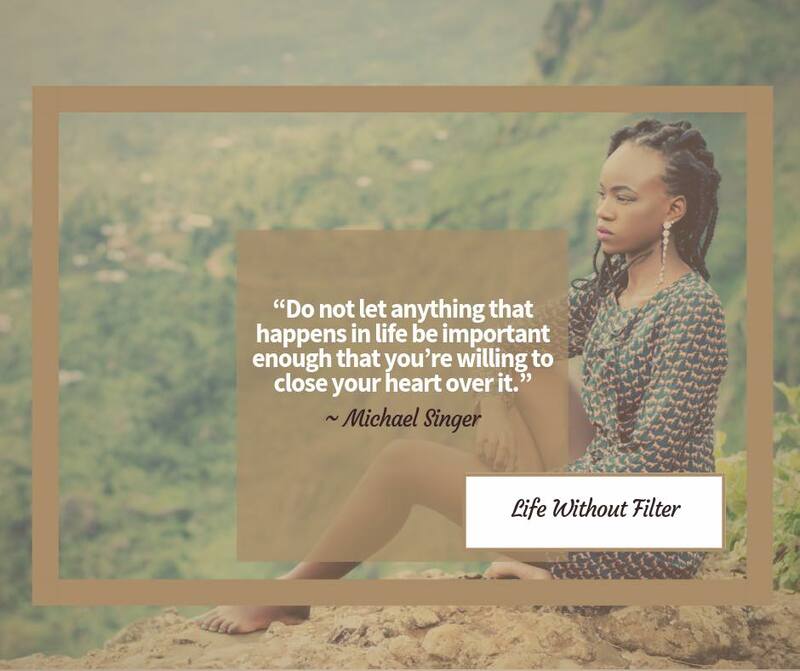 Last year, as I was traveling alone in Bali, listening to the audiobook version of Michael A. Singer’s The Untethered Soul, I had the most profound, heartfelt realization of this. In his book, Singer describes in a very thorough way, how every time we resist an emotion that arises in any given situation, we create a blockage in our energy, around our hearts. Singer described how every emotion that we ever consciously try to shove away and push out of our hearts will then become this negative energy field that we carry. But every time we release or allow any of these emotions to come through later, we also clear out some of these energies from the past. That’s why sometimes when the tiniest thing happens, we overreact. Old energy that was stuck gets triggered. Whatever we take in that we do not fully allow, becomes our reservoir of fuel to act out later. Often in ways we later regret. Feelings are not here to suppress, they’re meant to be expressed. They’re called emotions for a reason: they are energy in motion. There have been so many times in my life in which I have been fighting with my own feelings. But the very act of trying to control my emotions was only making them stronger and stronger each time. As I was reading Singer’s book, it just hit me in an instant: so this explains why I can sometimes cry like a baby from something as little as seeing a tv commercial with cute little baby seals in distress (OK, well that, and hormones maybe…), or cry more than the actor in the movie who loses his loved one for instance. It got me thinking: what is it about the emotions that we label as “negative” that makes them so hard for us to experience them, when ultimately, as we do, we release them? We set them free. We let them move through us, instead of build blockages around our hearts. How deep can emotions go? What is the maximum amount of mental, emotional pain that we can physicalize? To be honest, I don’t have the answer to that question, and there are probably experiences that some people have gone through that have caused a tremendous amount of trauma which makes it much harder to just experience and release. In such cases, seeking help and guidance in this process is probably a good thing to do. But I do believe there is a limit to the depth of our pain for everything we experience. This is something I personally noticed when I focused on something that had hurt me really badly in the past, but decided to really take time for. So I went to sit with it and allowed it fully in. And what I expected was some sort of mental breakdown. Or a huge wave of tears. Or a big knot in my stomach. But although it brought me some tears, yes, it shortly after became this pleasant wave of liberating relief. And instantly I wondered: why didn’t I do this earlier? Why did I carry all this bad energy around all the time? What is it about our society, our cultural, self-imposed norms, that makes us all shy away from shedding a tear? When really, there’s little more natural and healing you can do for yourself? Pain itself is not the problem, anger is not, jealousy is not, grieve is not, it is our resistance that makes it problematic. The warding it off. The holding on. The clinging. Resilience, Srikumar teaches, is available to us by default. It’s the behavior we all demonstrate when we’re learning how to walk: we all fall down, and initially we cry. But then our mothers or fathers come by and console us, kiss the spot, and make it well. So after awhile we stop crying. We get up and try again. And not one child gives up. So this is my resolution for 2019. My only one: I will ride the waves, and let if flow. I will welcome all the “good” and the “bad.” Come what may, this will be a happy 2019. I allow it. And I wish you the same. As I was writing this blog post the song below came on. And it couldn’t have been more appropriate. Enjoy! This is as enlightened as any article or scripture written. Leaving behind resistance is the gateway to heaven.